The NT Department of Primary Industry and Resources (DPIR) invited growers from the Darwin and Katherine regions to their field day at Coastal Plains Research Farm (CPRF) on Thursday 8 September. It showcased the current projects being worked on at the farm by Plant Industries Development staff. The field day included an informative tour of the farm and short presentations on the Cucumber Green Mottle Mosaic Virus (CGMMV) outbreak, on-farm biosecurity planning and changes to water licencing requirements in the Darwin rural area. 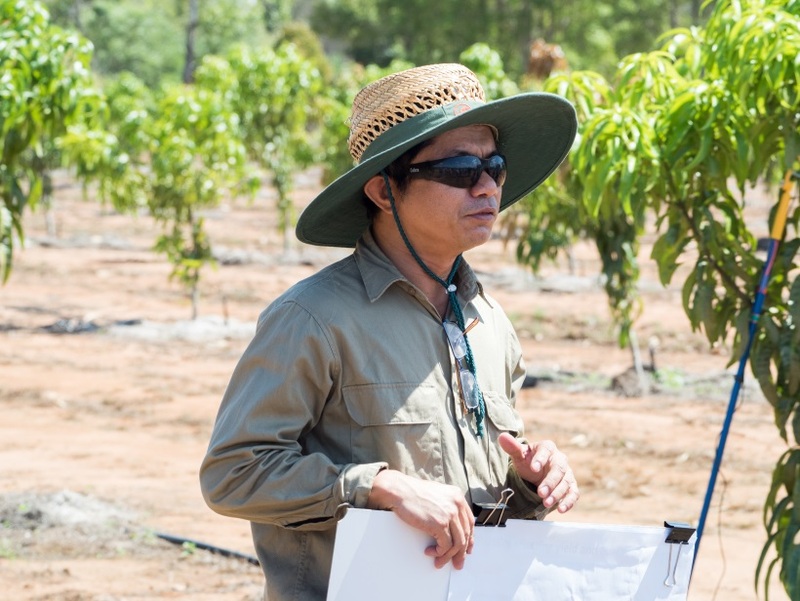 The farm tour began at the jackfruit seedling selection planting, which aims to develop locally adapted commercial scion cultivars for industry to propagate through standard grafting methods. This will reduce variability currently existing in seed-based orchards and improve consistent production of quality product for markets. The rambutan trial at CPRF evaluates the performance of marcott-established, high-density clonal orchard systems. Rambutan trees are difficult to propagate and a lack of demand for planting stock means many fruit tree nurseries do not produce grafted rambutan trees. Rambutan growers are left to propagate their own stock and previous research identified marcotting (air-layering) as a reliable, easy method of clonal propagation. Results so far are good survival rates and uniform growth rates across four cultivars. Advanced technologies will be used in a trial studying nitrogen nutrition in mango trees. Nitrogen has important physiological and morphological functions in the growth and development of mango trees. This trial will trace nitrogen fertiliser through the mango production system and determine how the plant uses it. With better understanding of this, mango producers can use nitrogen fertiliser more efficiently and develop nutrient management strategies to maximise growth, yield, and fruit quality. CPRF’s passionfruit trial aims to take advantage of the significantly higher prices the “Edulis” types return compared to Panama red types. Unfortunately “Edulis” types will not crop in our tropical climate. In 2014 DPIR crossed selected “Edulis” parents with selected Panama parents to combine desirable traits from both, principally the dark skin and flavour of “Edulis” and the fruit size and heat tolerance for flowering and fruiting of Panama. In 2015, 300 seedlings from those crosses were grown and the best 10 were selected and established at Berrimah Research Farm and at CPRF. Fruit assessments have begun this September. 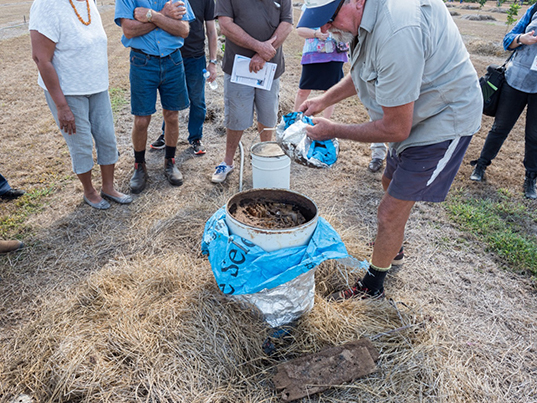 A demonstration of a termite aggregation drum struck great interest during the tour. The drum was placed over active Mastotermes termite galleries to lure them into the drum. After several weeks, the drum should be highly active with termites and can be treated with an appropriate termiticide. This allows a large number of termites to be treated at once and will ensure better transmission throughout the rest of the colony. 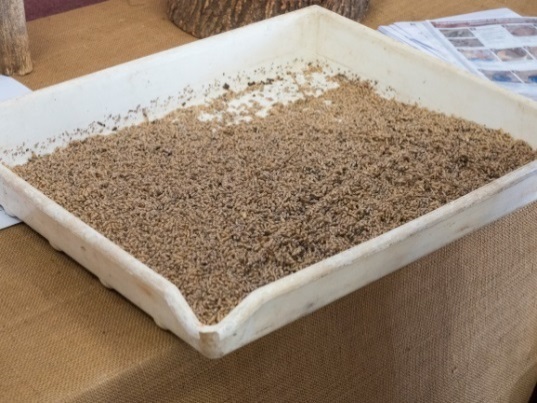 Detailed information on termites and the use of aggregation drums can be found on the DPIR website. (above) Senior Technical Officer Michael Neal opens an aggregation drum in the jackfruit planting block. (above) The total amount of termites in the drum after three weeks when it was emptied! Following the lifting of restrictions on banana planting in the Banana Freckle red zone in early June, research on Panama disease in banana has been underway in a quarantine area at CPRF. Attendees were able to view the area where 27 varieties in a large replicated trial have been planted and planting holes inoculated with the disease (Fusarium oxysporum f. sp. cubense , Tropical Race 4). This trial will determine varietal resistant to the disease. More varieties will be planted and subjected to the disease later this year. In another trial on Panama disease, 2000 banana plants from four parent lines will each be mutated via irradiation before being planted at CPRF. No two mutated plants will be the same, so the best resistant plants with good growth and fruit characteristics will eventually be cloned and further evaluated for commercial potential. All this research is part of a project supported by Queensland Department of Agriculture and Fisheries and by Horticulture Innovation Australia. The cool season tropical grass trial concluded the tour. This trial has been looking at the performance of different tropical grasses through the dry season to determine if there may be more ideal alternatives to the proven Finecut Rhodes grass. So far all seven varieties have been comparable in yield to Finecut Rhodes grass, meaning there is potential for farmers to grow any of the tested varieties. Quality analysis testing should offer a better insight into which varieties are most ideal. The field day was a successful event for Plant Industries and allowed us to show growers the work we are doing to support industry growth. CPRF is an important resource for enabling us to do this work and we appreciate the chance to invite growers to see the farm for themselves.